Community is a diverse thing indeed - it keeps life intersting! Yet another illustration for Clella Jaffe’s Public Speaking: Concepts and Skills for a Diverse Society. I collected the most diverse bunch of characters I could locate and had them pose for a family picture. I love my kachina (which I recall is a shooting star kachina) so had to have him be my central patriarch in the image. The metal figure on the lower right I got many years ago when I was in the Philippines on a summer mission. How about the saint with a Canadian Mounty hat? Nothing like mixing a couple figures together….. 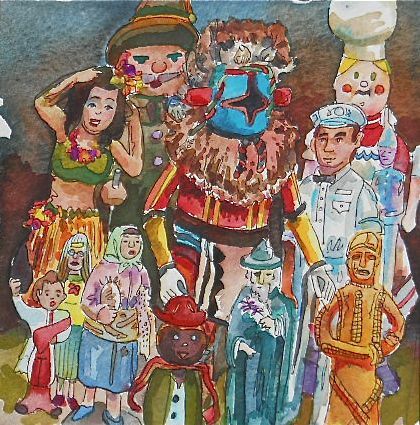 This entry was posted in Curious Endeavors and tagged Clella Jaffe, diversity illustration, Public Speaking: concepts and skills for a diverse society. Bookmark the permalink.